I have recently finished reading "The Architect's Apprentice" by Elif Shafak, starting while on our holidays in Portugal. It is a lovely read about unrequited and so a forlorn love between a lowly architect's apprentice and the Sultan's daughter, It's slightly magical, but with a far fetched end that sees Jahan, the main character, living a very long life to stretch his influence across the centuries. Based in Turkey, it is redolent with the smells of roses and rose water, e.g. "Jahan tried to utter something to raise her spirits, but he could find no words that she would follow. A while later a servant brought her a bowl of custard, flavoured with rosewater. 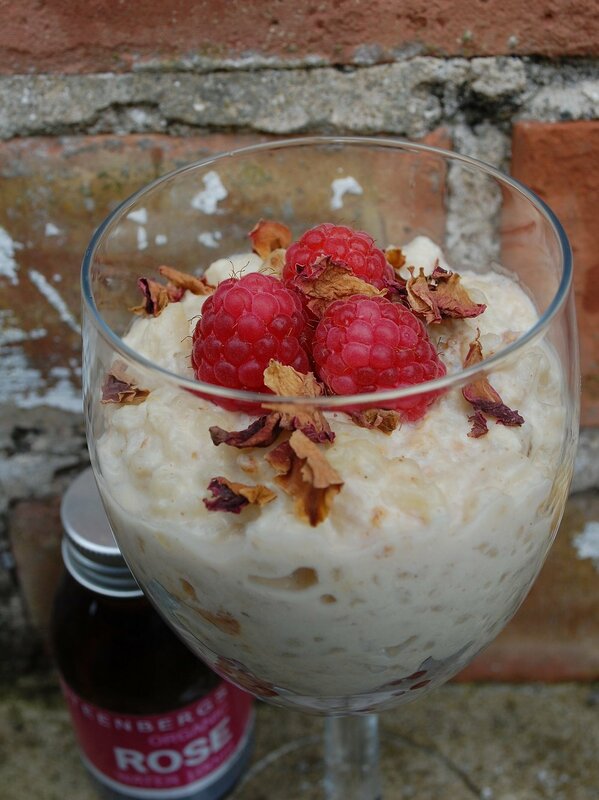 The sweet scent..."
It turned my thoughts to roses, so I made today a Rose Rice Pudding that we ate warm because outside it was raining again - summer where have you gone. 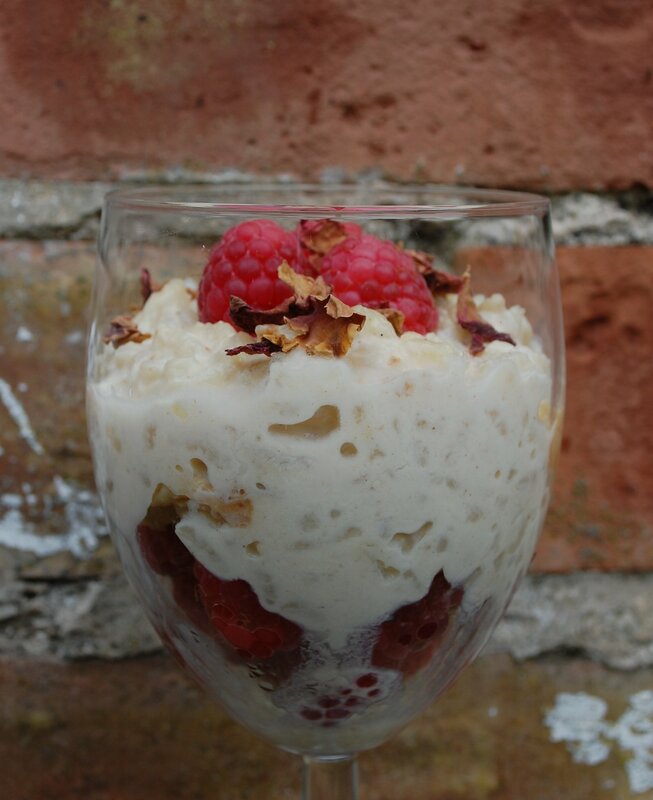 I then let it cool and made the leftovers into a Raspberry & Rose Kheer per the photo. Put the pudding rice, caster sugar, organic cinnamon powder and salt into a heavy bottomed pan. Give it a quick stir to mix it up a tad. Add the milk and the vanilla pod, then bring to the boil. When it starts to boil, reduce the heat and leave to simmer gently for 35 minutes, or until the rice is tender. Add the double cream, rose water and rose petals, then cook for a further 10-15 minutes, stirring constantly until nice and it has thickened. If you want to eat it warm, sprinkle some caster sugar over the top and either caramelise it with a blowtorch or under the grill. For rose kheer or a nice cold rice pudding, leave to cool for around 30 minutes, then place into the fridge for at least an hour. To make it into a Raspberry & Rose Kheer, I put some raspberries in the base of the glass and three delicately on the top.